So, you’ve got the best motorcycle in the neighborhood, and yet there is something just not right about the way you look on your beloved ride. Could it be the clothes that you are wearing when you are riding your motorcycle? If there were prizes for guessing, this realization would win the lottery! Yet, a lot of people just do not know what to wear when they are riding a motorcycle. You might have the meanest bike in town, but if you ride it in your formal clothes, you will end up being ridiculed for your fashion sense. So, given below are a few motorcycle clothing ideas that are both fashionable and functional. Leather jackets and pants have claimed something of an iconic status when it comes to tough-looking motorcycle clothing. If you happen to catch any of the biker flicks, you will definitely spot the protagonists donning these super-cool pieces of clothing. Yet, leather clothing doesn’t just make you look good on your motorcycle, it is also immensely practical. These jackets protect you from cold weather. Not only that! Some special varieties of motorcycle clothing are also resistant to water. This ensures you a smooth ride, even when nature is proving inclement. So if you wish to stay stylish this winter, you might want to pick a retro leather jacket for the next ride with your buddies. If you are an animal right activist or if you do not like leather clothing for some other reasons, mesh jackets can be your motorcycle clothing of choice. Made of a material that is actually tougher than leather, mesh jackets, in various colors, can give you a very trendy look. Unlike a leather piece that can make you unbelievably uncomfortable in hot weather, mesh clothing can be worn in all kinds of weather conditions. 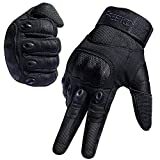 Motorcycle gloves, in an array of materials, don’t only add glamour to your biker appearance, but they are also very helpful in giving you the right grip during rainy motorcycle trips. In addition, they will also keep your hands warm in cold weathers. Many of these motorcycle gloves have gel pads and special armors to give you extra protection. You definitely shouldn’t ride a motorcycle without wearing a protective headgear. In this respect, motorcycle helmets, with swanky designs and interesting colors, can make you look good on your motorcycle, without compromising on your safety. 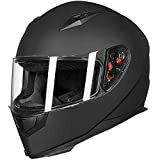 In fact, if needed, it is highly advisable that you even sacrifice your need for style, by opting for a motorcycle helmet that actually fits your head, and has the strength to withstand any sort of pressure. 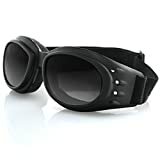 When you are on the road, eyewear and goggles are necessary to ensure that your eyes get protection from sunrays, rain splatters, snowflakes, and others. After all, a perfect vision is equivalent to a safe motorcycle ride, for both yourself and others. 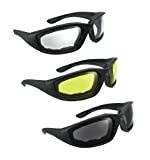 In addition, such eyewear also makes you look good on your bike. Motorcycle clothing is necessary for making you look good. Not just that, however, they are also extremely utilitarian. They protect you from the menacing elements of nature, and guard you against untowardly accidents.